Is it too far for you to travel to one of our face-to-face day courses? Would you struggle to find the time to take a whole day off? The Story Massage online course offers you the flexibility to study from home at a time and a pace to suit you. 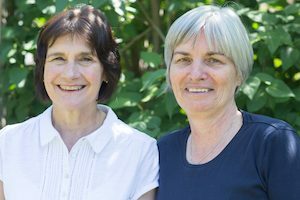 It covers the same material as the face-to-face course and your tutors are Mary Atkinson (left below) and Sandra Hooper (right below), co-founders of the Story Massage Programme. Can I book on the Story Massage online course? The online training option is open to everyone with an interest in sharing positive touch activities with children of all ages and abilities. 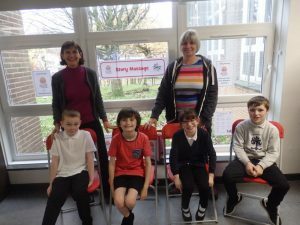 Students include parents, teachers, complementary therapists, SEN staff, baby massage instructors, Relax Kids coaches and health care professionals. It is helpful for those wishing to use the Story Massage Programme at home or work, or both! If you are an independent practitioner, please do check with your insurance company or contact us on info@storymassage.co.uk to check the course meets your requirements. In this option, the course includes Story Massage stickers and a copy of the book. These will be sent to you within seven days of purchase (if you live in the UK). Please click on the icon above to book your place via paypal. We will then contact you via email with an access code to begin the course. If you are based outside the UK and don’t have the book, please use Option 2 below. The cost of the online course is only £115 as the cost of the book and stickers (optional) is covered by you. The book is available an Ebook – click here for more information: Singing Dragon Publishers. Please click on the icon below to book your place via paypal. We will then contact you via email with an access code to begin the course. If you wish to convert this value into your local currency, please use this Currency Converter. You can find out more about Story Massage resources and order directly from the Story Massage team here: Resources. There are five modules to complete. These modules are carefully designed to take you through the course with a step-by-step approach to help build your confidence. The course takes around 12-18 hours of study and covers the same material as the face-to-face training day. Module 1 introduces Story Massage and explores the importance of positive touch activities for children of all ages and abilities. You will look at the many benefits of Story Massage and how it is being used in different contexts. Module 2 has video demonstrations of the ten Story Massage strokes. You will learn their names and symbols and begin to understand how they can be used to illustrate words in a massage story. During the module you will also explore how strokes can be adapted for children with additional needs. Module 3 introduces some of the basic guidelines for using Story Massage in a respectful way for different age groups. You will learn how to share a massage story and pick up some valuable tips and ideas for using Story Massage. Module 4 shows you how to adapt a familiar story or nursery rhyme as a massage story. You will explore the process of matching strokes to words. You will be encouraged to begin to write your own massage story with plenty of prompts and support. Module 5 helps you reflect on your course experience and invites you to think of ways that you will be using Story Massage to suit you and those you are sharing it with. You will also be introduced to easy-to-make resources for presenting and sharing massage stories. “By far the best online course I have done. I am not usually a fan of online training. However, due to personal circumstances and work, I was unable to attend a day course. And this course was fantastic! The use of text, videos and the chance to reflect and jot down notes was great. 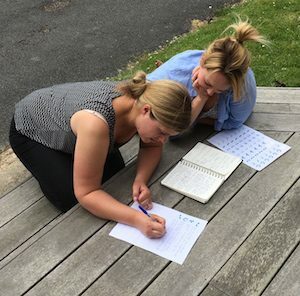 I had heard some wonderful things about the course, and it certainly lived up to expectations.” Kate Malley, Assistant Head and MISP Instructor. “I can honestly say the Story Massage training is one of the best courses I have done as far as content and support go. Online courses can sometimes make you feel lonely, or alone, but not this one! I was sad that I couldn’t attend in person due to the need for accommodation and travel costs, but it was an excellent alternative. It was well laid out and you feel supported every step of the way. You feel very included. I would encourage anyone interested to dive in … I really would.” Tracey Alston, Practice Nurse and Holistic Therapist working in a respite unit for children with profound additional needs. Live support and virtual classroom – there are opportunities to ask questions by email or our virtual classroom sessions. You’ll also find lots of ideas and support from YouTube videos, Facebook and regular newsletters. Six months access to Course – You will have full access to the online course materials for 6 months. This starts from the date you begin studying, not the date you book the course. We can offer an extension of 6 months for a fee of £25. Free book and stickers – Option 1 includes a copy of Once Upon a Touch …Story Massage for Children by Mary Atkinson and Sandra Hooper and Story Massage stickers for creating your own massage stories. Downloadable resources– practical and easy-to-use answer sheets to help you review and reflect on your learning during the course. Technical support– if you need some extra help getting started or using the Story Massage online course, we have experts to help you. No special software required! – The videos and Story Massage audios (mp3s) will play on the software on your computer or electronic device – you will access it via the internet. Certificate of Completion – at the end of the online course you will receive an email containing your certificate of completion. This course is for Continuing Professional Development. If you would like qualify as a Story Massage Instructor, please see the information below. “I felt engaged…. more so that I thought would be possible via an online course where positive, nurturing touch is at the centre! I am impressed by the authors’ attention to detail and recognition of different learning styles. It is a well-balanced and varied course with excellent pacing of sessions to build up confidence. Most of all, I appreciated the gentle guidance with tips, suggestions and lots of inspiring and useful links to resources.” Helene Goulet, Elementary School Teacher and MISP Instructor. How is this course assessed and recognised? There are simple interactive self-assessments throughout the Story Massage online course (see below). At the end of Module 5 you will also be asked to complete three questions about the course and submit this plus an example of a massage story that you have adapted or created. The Story Massage online course is approved for CPD points by The Federation of Holistic Therapists (FHT). We will issue you with a certificate of completion which can count towards your CPD (continuous professional development). You may wish to confirm with your insurer/employer that they will accept this course to use within your work. Can I become a Story Massage Instructor? 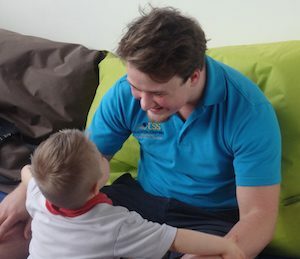 Are you currently an independent practitioner working with babies or children – such as a Baby or Infant Massage or Yoga Instructor or a Relax Kids Coach? 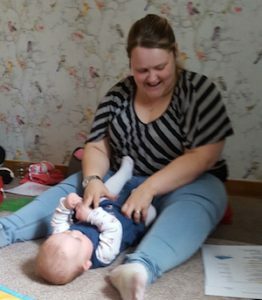 You may choose to qualify as a Story Massage Instructor in order to gain insurance to run your own groups such as Baby Story Massage or peer massage sessions in schools. (Please note: an Instructor Certificate does not qualify you to train others to use Story Massage in their work/business. There are only two trainers – Mary Atkinson and Sandra Hooper co-founders of the Story Massage Programme). If you would like to become a Story Massage Instructor, we can update your certificate for a small fee of £25 for the administration. We ask you to send us a video (in addition to course assessment questions) to show that you are demonstrating the strokes correctly. Here is an example of a video sent by a successful student. We will check your video and offer helpful feedback. Most insurance companies are happy to insure people who have completed our assessments for the online course but we suggest that you check first. If you have any specific questions about the online training course or gaining insurance then please contact Mary and Sandra at info@storymassage.co.uk. We want to make the course as easy and accessible as possible for everyone. It is fun and practical, just like Story Massage! We really look forward to working with you. Lorraine E Murray - It's Your Time to Shine! Heidi Mahon, Class Teacher, St James Primary School, Dublin 8. Hazel Cunningham, Relax Kids Coach and Independent Nurture Practitioner.